The original definition of the Far West didn’t include Colorado, Wyoming or Montana. The latter two are primarily “plains” states as is the nearly half of Colorado where 88% of that state’s population resides, the part that was originally part of Kansas. Plains differ from prairies but they are both still relatively flat. At one point they were distinguished as short grass and tall grass prairies. By the 1840s when eight or nine sets of my ancestors crossed, the short grass area was just known as the plains or high plains. Despite their “Rocky Mountain high” reputation, all but 12% of Coloradans live in a mix of piedmont and plains. Let’s just say John Denver was generous to both Colorado and West Virginia, as he was to tourism in general, back as I finished college and began that career. Now in retirement, that’s part of the reason Mugs, my English Bulldog, and I enjoy annual 7,000 mile cross country road trips. This will be our seventh in five years, utilizing largely different routes each time. I’ve written about the far north route we plan to take back home this year. On the way out we’ll take the southern route, dropping straight south through Chattanooga to Birmingham after we crest the divide between the Great Smoky and Blue Ridge mountains. If the world was flat, on a clear day at that crest we might be able to see the Rockies. At Birmingham, we’ll take I-20 across parts of Alabama, Mississippi and Texas that we haven’t seen from the road. 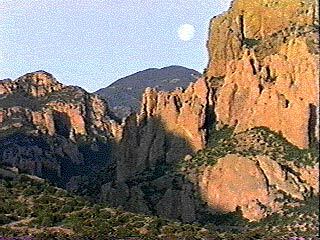 At the western tip of Texas, we’ll shoot north up the Rio Grande Valley into central New Mexico for a peek at the “needles” of the Organ Mountains near Las Cruses to begin visiting several Civil War sites. In his 2011 book American Nations: A History of the Eleven Rival Regional Cultures, Colin Woodard writes about two distinct waves of Euro-American colonists who first arrived in the Far West between 1847 and 1850. Some of my Mormon ancestors who were among the first to arrive along the Rockies were outliers. Four had southern Appalachian roots or came from the south, six were indeed Yankees and six arrived direct from various British Isles. Three also became “forty-niners” for a time. People don’t realize that in the decade when 10.000 other Mormons followed them into the Rockies, missionaries had converted three times that many in England, Wales, Scotland and Ireland combined. He was a Missouri boyhood friend of Mark Twain and had partnered with him to mine for silver and gold in the eastern Sierra Mountains around Virginia City. But his roots were in the southern Appalachians not far from where I live now. At the time of his enlistment, Civil War skirmishes had already occurred near Las Cruses. Using Texas volunteers and relying on Confederate sympathizers, the Rebels were trying to extend a corridor to cut off Union supplies and control strategic harbors in Southern California. From Las Cruses, Mugs and I will shoot across White Sands, turning north at Alamogordo where during my senior year of high school my uncle flew F-4 Phantom fighter jets at Holloman Air Force Base, including a stint at Elmendorf, AFB in Anchorage. Before I graduated, his 389th FS was deployed to Viet Nam as part of the 366th TFW, soon to nicknamed “The Gunfighters,” when gun pods were adapted to their planes. He flew three consecutive tours including 300 missions intercepting enemy MiG fighters over North Viet Nam. Of the 193 USAF F-4s shot down over North Vietman, 33 were to MiGs, 30 to SAM surface to ground missiles and the remainder to withering AA fire. Even hampered with the severe restrictions imposed by politicians on AF Phantoms, including the 389th, they shot down 107.5 enemy fighters. Ignominiously, the last of the old Phantoms will be shot down this year where they have served as target practice since 1991 at Hollomon. My uncle was killed several years later flying for the DEA along the border with Mexico. It was 40 years ago, and our visit will be a chance to salute his courage and service once again. From there we head 200 miles via “blue highways” up to the site of a pivotal Civil War battle 18 miles out of Santa Fe at the Glorieta pass (image in this blog) through the Sangre de Cristo Mountains, the southern most Rockies. Fifteen years before, two of my Mormon Battalion ancestors passed over the Glorieta during the Mexican-American War. A couple of years later they were mining gold on the American River. Confederate forces had taken Santa Fe and planned to hold Gloreita Pass to stop gold and silver from reaching the Union while moving north to seize the gold fields in Colorado. But Union solders from Denver intercepted the Rebs at Gloreita in late March 1862, pushing them back to Albuquerque and putting an end to Confederate hopes of a west coast. Three years and a month after Glorieta, the Civil War effectively ended with the huge surrender to General Sherman at Bennett Place in Durham, North Carolina where I now live. The Santa Fe Trail had been blazed into a wagon route between Missouri and New Mexico in the late 1820s, a few months after Mexico revolted against Spain. For centuries it has been a trading trail by foot, horseback and pack mules connecting the North American interior to Mexico. From Missouri, wagons began carrying supplies down the trail in 1824 returning with gold, silver and furs. Traffic grew from 26 wagons that year to 414 by 1846 on the eve of the Mexican-American War. It ballooned to 3,033 in 1860 on the eve of the Civil War, carrying more than 82,000 tons and employing 9,084 men and giving it nearly as much strategic value as the more central overland route through the Rockies. But its namesake, Santa Fe, wasn’t the terminus. From there, goods were transited on the Old Spanish Trail, cutting across the Rockies of southeastern Colorado, up and across central Utah and down to Los Angeles and back. Mugs I will follow part this route before cutting north to rendezvous with my grandsons and daughter and heading to a lake in the Northern Rockies. By 1880, the Atchison, Topeka, and Santa Fe Railroad reached Santa Fe using portions of the old trail and ending it as a wagon road. Four years later, my great-great grandfather Harper returned to captain a Mormon wagon train west in 1855 from a new trailhead in Atchison carrying more than 300 French, English, Welsh, and Italian converts. Leaders in Atchison at the time were joining with others in Topeka to charter the railroad. By 1885, the “Santa Fe” completed a southern transcontinental railway connection through to San Diego, competition for the Union Pacific’s one across the heart of the Rockies in 1869. Less than a decade later, the Great Northern punched through another transcontinental route from St. Paul to Seattle through Spokane, soon to be a strategic center for four transcontinental railroads. When I was a boy, electric train sets were prized, and my favorite was the red and gold nosed “Santa Fe,” but my favorite railroad logo was always the “Mountain Goat” of the Great Northern. Regardless of whether we take our own southern route out or do it on the return, it should be quite a trip. Mugs can’t wait.